I opened my hours and gazed at the blaze of light that was slowly creeping up the slopes around me. And a feeling of awe broke the shackles of sleep that had me tied down to my seat. And then…total disbelief. I sat up and rubbed my eyes, totally sure that I was dreaming. And then again and again. And then I just shouted…L! L! Bear! Bear! There was a dark brown grizzly clambering up the mountain, very very close to the road. And then before I regained my breath, there was another one right in front of us. Just to give you a bit more context, we were in a Greyhound bus, travelling from Vancouver to Jasper National Park. As the day melted into the night, and night unwrapped itself into dawn, I had marveled at the sheer majesty of the mountains around me. It was pure, unadulterated, “in your face” splendor. There’s no other way to describe the beauty of the place. But nothing had prepared me for this. This was not the first time we had seen a bear in Canada. And it wouldn’t be the last. But this memory was special. The bear on his legs, almost standing straight like a human being, his “hands” being used for support, as he climbed the rocks. And the sun slowly embracing the bright blue sky as the mountains towered over us. We had been unusually lucky. 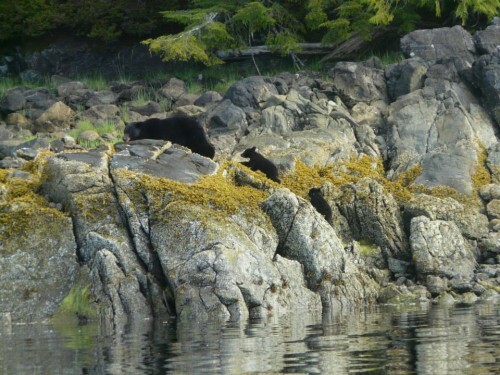 A few days back we had gone Bear watching in Tofino, and seen an unprecedented 7 bears. The icing of the cake was that one of them was a mama bear with two cubs! The cutest sight ever! Later a friend saw the pics and in a spurt of adoring “aww” affection, remarked that she would love to cuddle the babies. I had to share this fun fact with her – a grown up grizzly can flick a 50 kilo rock with one paw! How’s that? As a number of hikers in Canada would tell you, it’s unlikely that you will not see a bear in Canada. 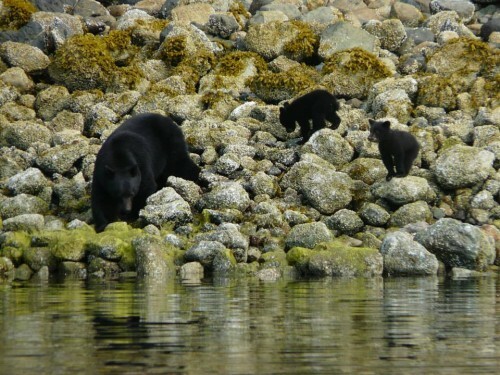 But on the off-chance that you wont, or that you won’t go hiking, you could go for a bear watching tour like we did. We chose two companies Ocean Outfitters and Remote Passages and both were great trips. The trip is on a Zodiac around the islands and you get a real feel of elements. The guides are pretty knowledgeable and competent and help you with all the necessary information. 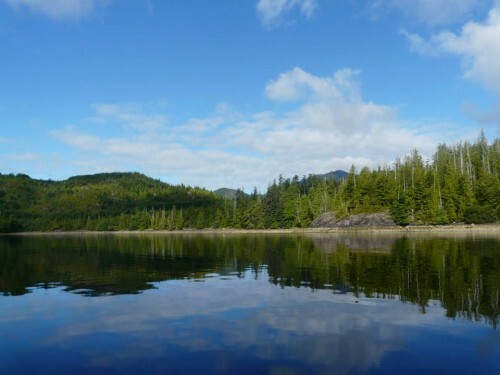 Tofino is located in a region called Clayoquot Sound in British Columbia, comprising of a group of land and marine inlets, all draining into a central marine catchment area. Known for it’s winter storms, it’s also popular for surfing, whale watching, and of course it’s beautiful beaches and trails. Air: I am told that there are several airlines that have scheduled flights from Vancouver to Tofino. But I wouldn’t recommend this. Ferry: BC Ferries provides services from Vancouver to Vancouver Island (Nanaimo). We boarded the BC Ferries terminal from Horseshoe bay to Vancouver Island. The trip is roughly 1.5 hours. Tofino is accessible directly by car or bus from Vancouver Island. 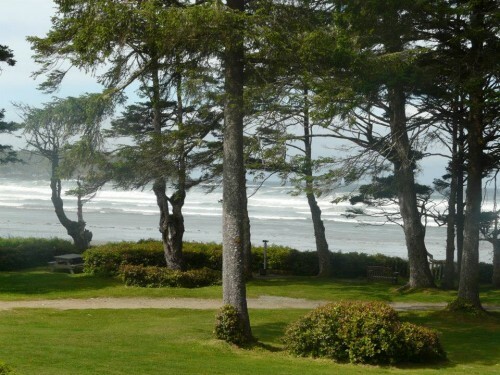 Where to stay: Since Tofino is quite popular, there are a quite options for accommodation. We chose to stay in the luxurious Pacific Sands resort, and I would totally recommend it. There are also quite a few budget and mid-range hotels as well.